Given my schedule this summer — which is class & work on Mondays and Wednesdays — I get a lot of knitting done on Mondays and Wednesdays. Wait, you might say, didn’t you just say you’re busy those days? Yes! 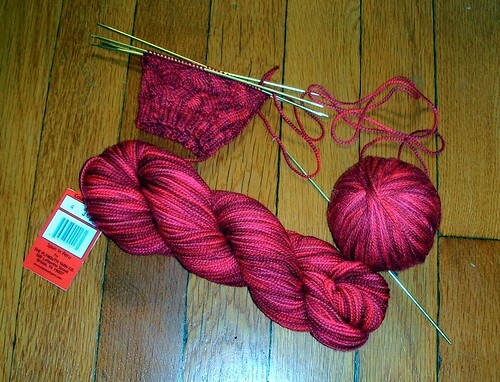 But I also have an hour-and-a-half commute each way from home to school/work, and I tend to knit on the subway. 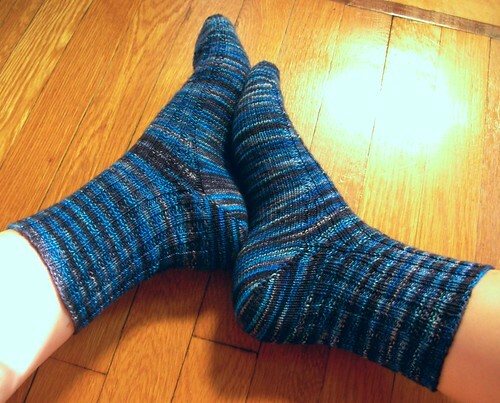 Last week, I finished these socks, which are a simple toe-up 2×2 rib. The yarn is Claudia Hand-Paint, which I love for its sproing. It just squishes so nicely once it’s knit up: there’s so much life to the yarn! The colors are fabulous, too, which doesn’t hurt. Having finished those, and woven the ends in on Sunday, Monday I started a new pair! 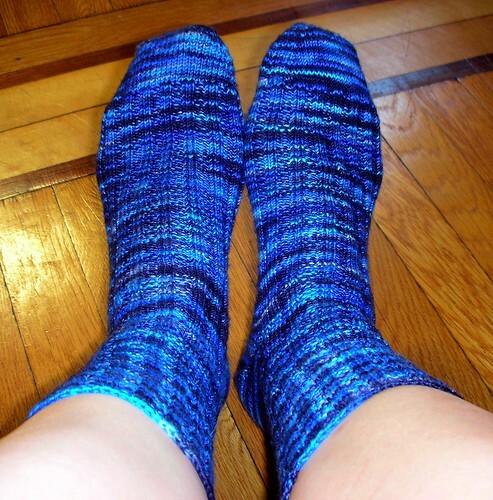 These are Plymouth Happy Feet yarn, which I’ve never knit with before. The yardage on the Happy Feet is only about 192 yards, which may sound like a lot — but remember, big-footed family. My default assumption for a pair of socks is that it will take about 200 yards of yarn. 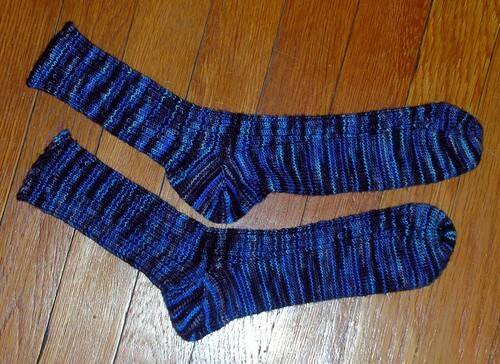 So it was a bit of a surprise when I decided that, no, I wouldn’t be knitting these socks toe-up — I’d be knitting a pair of Monkey Socks from the cuff down, and if I have to add in a different-colored toe, I’ll add on a different-colored toe. Previous Previous post: Sewing on a Singer 66. Next Next post: Blocks of the Month, halfway done.